St. Edmunds Bacon Factory Ltd. was opened in 1912. It killed bacon pigs and sold them on the London Provision Exchange. In 1926 pork was first produced as well, this being sold at Smithfield Market. A very few sausages and pies were made and sold locally. The factory has always had an unsurpassed reputation for quality. But although it expanded and prospered greatly, there was little change in the pattern of events until a few years ago—when diversification was first introduced. 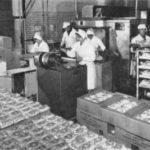 Today, besides green and smoked bacon sides, the range of products includes bacon joints, gammons, vacuum-packed bacon in three qualities, sausages, pork pies, baconflips, luncheon sausage, lard, pork carcasses, cuts and offals—and even a cuckoo in the nest in the form of steak and kidney pies. A high proportion of output is marketed direct to retailers. Clearly, there has been a profound change of policy in a very short time, which is the more surprising when it is realized that the factory at Elmswell is unique in being Britain’s only independent, fully farmer-owned bacon factory. For pig farmers’ interests do not generally extend further than obtaining a satisfactory price for their pigs: yet over two thousand East Anglian pig-farmers own jointly a highly sophisticated modern factory. 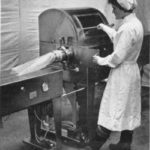 The causes leading to this production and marketing revolution probably first became apparent on de-rationing in 1954, when that influx of foreign bacon began which now accounts for almost two-thirds of British consumption. The resultant trading difficulties gradually made necessary more aggressive marketing by the home producers, and in St. Edmunds’ case this meant the beginnings of diversification and direct distribution. 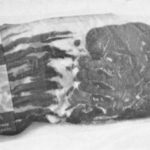 The belief that the best British bacon, given consistency, can be much better than its highly regarded foreign competition led to closer attention to grading standards and liaison with the producers. St. Edmunds is obviously uniquely well-situated in these respects. But the real dynamic behind St. Edmunds’ present complex yet streamlined appearance came with the appointment as general manager in 1963 of Mr.K. C. Crook, who describes his purpose as being “to fit the factory to the modern economy”. He emphasises that despite the expenditure last year of over £70,000 on modernization and reorganization, the process must be a continuous one if the factory is not to slip behind the pace of economic developments. Thus, the management team has been strengthened; on the recommendation of consultants, cost accountancy has been introduced and a full-time executive employed on this; other recruitments include a work study expert and a bacteriologist; new production, packaging, grading, refrigeration and handling equipment has been purchased, and large-volume items are processed on a flow-line system; stringent hygiene regulations are enforced; distribution has been re-organized and merchandising is now carried right into the store; the services of a public relations consultant are retained and there is an excellently produced house magazine. Yet nothing has been done without a reason. 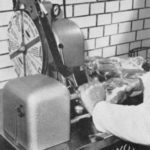 An example of particular interest to our readers is that a very high proportion of bacon throughput is now prepacked in vacuum pouches (some of it, incidentally, under the demanding “St. Michael” label). 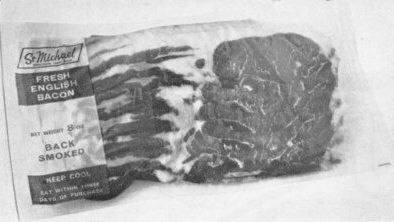 While prepacked bacon carries a higher profit margin than sides, and is necessary when marketing direct to some retailers, the main factors behind the decision to extend so greatly the prepacking operation were, firstly, not so much higher profits as stable prices and, secondly, the ability to achieve maximum consistency of quality. Smithfield Market and the London Provision Exchange are subject to violent price fluctuations created by over-supply or under-demand, yet which are not reflected by conditions in stores throughout the country. These hazards are thus, in a sense, artificial by virtue of their localization, and can be almost entirely avoided by marketing prepacked bacon direct to the retailer rather than sides to the markets. The fact that only a third of St. Edmunds’ trade is now in side bacon is seen by the management chiefly as an investment in security. The factory itself occupies a twenty-five acre site and employs 300 staff. Much of the site is taken up with effluent disposal, a new lagoon system having supplemented the former filter-beds, which now form only the first stage. Members themselves declare their pigs to be for pork or bacon. Yet of the 1,500 or so bacon pigs taken in weekly, only 1,000 are usually cured. The remainder fail the searching inspection and grading on the score of fat- to-lean ratio, and are chopped and processed into pork or small goods. Weekly intake of pork pigs averages 1,000. The factory wants cutters (Continued overleaf) of 120-140 Ib. deadweight which can be employed more profitably, and by paying premium prices for such pigs is persuading members to sell heavier pigs. Almost all bacon pigs and 50 per cent. of porkers are bought on a contract basis. Although the factory may in times of short supply buy outside members, the latter always receive priority. A striking achievement has been the introduction into the existing buildings, under the direction of works manager Mr. Cliff Jacques, of a smooth flowline system. After progress through collecting pens, killing pens, and the slaughterhouse, the pigs perform most of their journey through the factory suspended from the Iwel Engineering overhead rail system. Porkers move from the slaughterhouse up to the first floor, where they are graded by Smith’s ultrasonic equipment. They then move through the chill rooms, when carcasses to be sold as sides descend to the adjacent van loading bay. Meat to be sold cut goes to the cutting room on the ground floor, and to the same loading bays via the despatch room. Bacon pigs, after leaving the slaughterhouse and offal rooms, move to the curing tanks (whose brine mixture is a factory secret) where they spend five days. Maturing rooms come next, after which bacon to be smoked moves on to the smoke stoves where they are treated for four hours over a smoke of oak chips. A number of separate processes are carried out in the prepacking room. Vacuum-packed bacon is sliced at high speed on an automatic ANCO machine from America at a rate of 600 slices per minute. 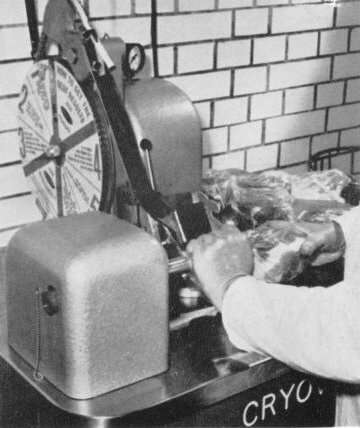 The slices are weighed on Avery scales, and vacuum-packed in Jessett and Henry Concord machine. 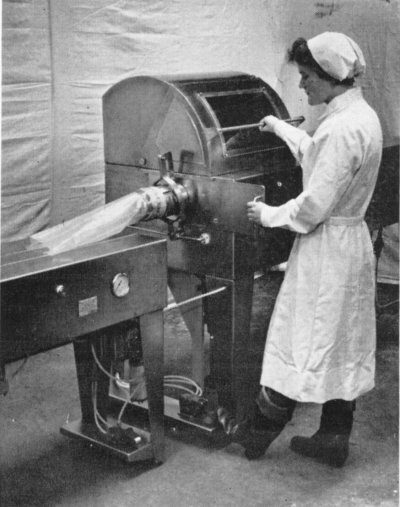 Bacon joints and gammons are shaped in a Meta-Press and vacuum packed in Cryovac equipment. After prepacking, the packs or joints are cartoned in Tillotson cases. Adjacent to the prepacking room is the sausage room, where sausages are chopped, filled and linked on Wetter equipment, and hand-wrapped in printed Pakcel wrappers. 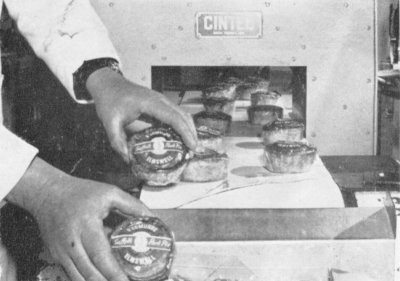 An example of the care shown throughout the factory is the Cintel metal-detector, under which all sausages pass. 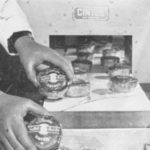 Another detector is employed in the pie factory, a separate building opposite the despatch bay, where pork pies are cooked in a large Gilbert reel oven before being packed in Pakcel bags. 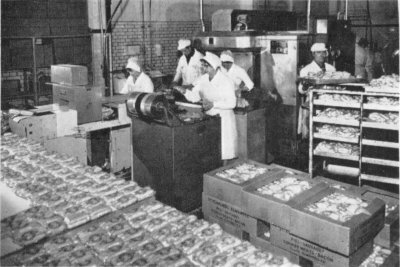 The popularity of St. Edmunds’ pork pies led to a demand for steak and kidney pies from the same source: so the slightly odd situation has arisen where the high quality of what was originally a by- product has caused the factory to purchase small quantities of steak, which is not produced by the members! While pigs are brought to the factory by local hauliers, distribution is effected by St. Edmunds’ own transport. In the last five years the fleet has more than doubled and now comprises twenty- seven vehicles averaging 2½ tons each, including a bulk distribution lorry, these being used to service retail outlets alone. The Ilford depot is staffed by a manager, two van salesmen, and a sales representative together with the sales staff forsales of bulk bacon, while there are van salesmen also at Norwich, King’s Lynn and Peterborough, all these being supplied fresh daily by trunk vans. Representatives can call on a merchandizing representative to assist in sales promotion. A highly efficient system ensures that orders are met promptly, yet means also that distribution is almost entirely against firm orders. Every effort is made to meet a five- day week for retailers’ convenience. The vanmen work under an incentive scheme, which has proved so successful that it has been introduced also to the prepacked bacon department, and will be further extended, a department at a time. The factory now faces the future with the confidence born of a thoroughly up-to-date production, management and distributive framework. Further and greater expenditure on modernization is planned to keep pace with increasing market penetration, and there is no doubt that Elmswell will give further striking proof in the next few years that this form of ownership yields nothing in keeping pace with technological and commercial progress.